We began to track DPW in Monday’s premarket report, and with the help of a key Bitcoin related PR, the stock has performed quite well since then. We suggested that Monday’s bullish activity could be followed up with more of the same in yesterday’s report, and that’s certainly what occurred. We will once again track this play very closely, with Bitcoin streaking to new all time highs yet again, touching $12,798.78 shortly after 8AM Eastern this morning. The company just released plans to launch a line of Bitcoin mining hardware, and anything related related to the space should continue to be a hot ticket item amid the current crypto-craze. We’ve come to rely on going after big options trading opportunities, especially after a company releases its earnings. Despite having fallen short of Q3 expectations for profits and revenue, AEO posted solid same store sales growth, and issued promising guidance. As a result, the stock has continued its recent bullish run, and we’re going to want to signal the AEO Weekly $16.50-17.50 Calls for observation over the remainder of the week. 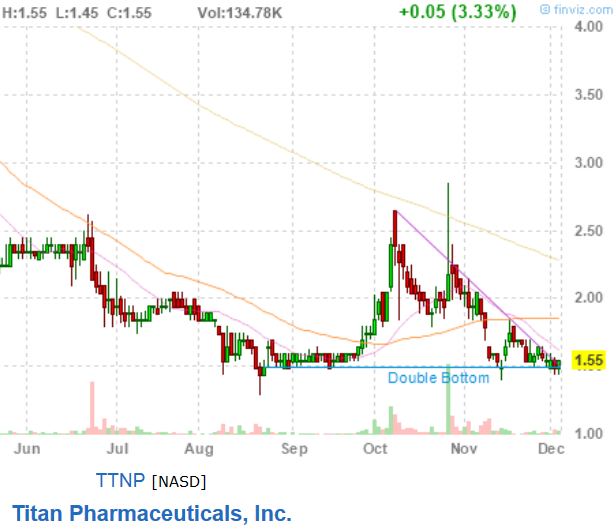 We’re going to place TTNP on watch this morning as a potential bottom play. One look at the chart snapshot below clearly shows that the stock is currently exhibiting a strong double bottom signal. We can also see the nearly 100% move it recorded in recent months. We’ll be looking for similar activity in coming sessions.